These smartpen assistive technology activities will give you an idea of how the Livescribe smartpen has the potential to level the playing field for many individuals who have been searching for tools that make them more independent and successful learners. Livescribe products were designed using Universal Design for Learning (UDL) principles to assist all students and adults in their learning and work, and it has been very exciting to see students of all ages pick up smartpens and become more independent, engaged, and successful learners. Browse the smartpen assistive technology activities below. Livescribe smartpens are great for slowing down or speeding up audio replay. Audio can be slowed down to 50% or sped up to 200%. Even when sped up, the audio doesn't sound like a chipmunk because the vowels don't seem to be distorted. This works well for improving comprehension or allowing for quicker review of familiar information. Note taking is very difficult - even for students that don't have a learning or physical disability. Livescribe smartpens enable students to become more independent and better note takers by allowing them to take notes with audio linked to their notes and then easily replay the audio at any point simply by tapping on the ink. This can also enable them to add additional notes to make their notes more complete. Below is a video of a special education teacher discussing note taking strategies with the smartpen that she used with her students. Pencasts of daily lecture notes can be shared using email, teacher websites, blogs, or Google Docs so that students and parents can access them anywhere - at home, the library, or on mobile devices. Parents can then have the opportunity to become involved in the learning process and students can benefit from reviewing difficult concepts as many times as needed for understanding. If a student's IEP requires that test directions be read orally and that the reading of the test direction be repeated as needed, a Livescribe smartpen can be used for these purposes. Also, if the student's learning disability is in written language and a scribe is writing student responses, a smartpen can be used to record them, assuring accuracy. Students can also record their answers orally by placing a dot on the Livescribe paper that is linked to their oral recording of the answer. Penmail is an effective and efficient way to improve school/home communications. In addition to requiring very little training, it is inexpensive and allows teachers and parents to easily exchange short messages without requiring interpreter or phone access. It can also help break down language and literacy barriers. Penmail (smartpen + voicemail) can easily be recorded by a teacher with a smartpen on a page in a student’s Livescribe notebook and sent home with a student, where a parent can listen to it and potentially respond with their own penmail. If parents need to hear the penmail in a language other than one spoken by the teacher, then the teacher can simply hand the notebook and smartpen to someone who can translate the message. Students can record their activities at each center and the teacher can then listen to determine if each student fulfilled his/her role/obligation. This eliminates the need for a teacher's immediate presence at each activity to assure that the activities are done. This helps keep students on-task. The teacher can check for understanding and adjust their instructional conversation with students in order to tap into higher levels of critical thinking. 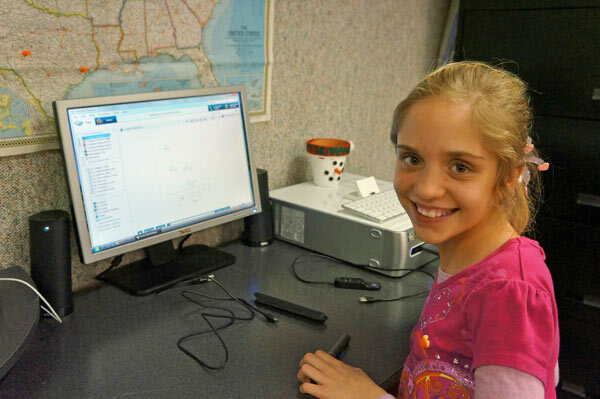 Many students with hearing loss are finding that the best way for them to use a smartpen is to loan it and their Livescribe notebook to a classmate and ask them to take excellent notes with it. Then, later, when the student with the hearing loss wants to review the notes they can plug the audio from the smartpen directly into the boot of their hearing aid amplifying sound as needed. Or they can watch and listen to a pencast of the class notes with the audio amplified on their computer or mobile device. Tactile markers can be added to 3/4-inch round Livescribe Sound Stickers enabling students with vision loss to locate them on handouts or classroom objects. By tapping on the pre-recorded Sound Stickers these students can listen to instructions, the reading of questions, or any other audio that was recorded onto the Sound Stickers. This example shows small, inexpensive rhinestones being used as textile markers at the top of each Livescribe Sound Sticker. We want your ideas for more smartpen assistive technology activities!